There are a wide variety of pearls available in today’s market. Our pearl education will guide you in the right direction. Below you will find information to give you a better idea and understand of what is available in the market, and to help you get a better understanding and educate yourself on your pearl purchases. Educating yourself more about pearls, their types, colours and overtones, will help you make an educated decision on the best pearl jewellery purchase for you. We would like to encourage you to read through our pearl guide and characteristics to become familiar with the incredible quality and ranges that’s pearls have to offer. The type of pearl is the most basic factor to consider; whether the pearl is a freshwater pearl, an Akoya pearl, South Sea pearl, Tahitian or cultured or natural. Each type of pearl is created by a different species of oyster, usually living in a different region of the world forming in different water temperatures and conditions. 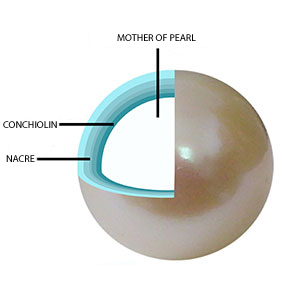 All of these factors have an impact on the characteristics in the quality of the pearl. Most types of pearls are used in a large range of varying jewellery. Some types of pearls are much rarer than others, increasing their value significantly for that reason alone. Other types are more common which means the value of that pearl maybe influenced by the demand rather than the type itself. South Sea and Tahitian pearls are generally larger than Akoya’s, and each type tends to have its own distinctive range of colors. The value and quality in a pearl is measured according to a combination of several different pearl characteristics or attributes. These characteristics are: the type of pearl, the thickness of its nacre, its luster, the cleanliness and texture of its surface, its shape, its colour and its shape and size. Because the pearl is a grown naturally, these elements have a large and varying range. Although all of them affect the value of a given pearl, some of the factors are more objective, while others are more of a personal preference. The two most commonly used grading systems that are in fairly widespread use, and used by nearly every major pearl retailer globally are; The AAA-A gem system and the A-D system (also called the Tahitian system). SURFACE Pearls having flaws at least 60% of the pearl surface, with 20% containing deep imperfections. Flawless pearl on 40% of its surface with the remaining 50% having minor imperfections and 10% containing deep flaws Flawless pearl on at least 80-85% of its surface, with the remaining 15-20% containing only minor imperfections with one or two deep imperfections Flawless pearl on at least 95% of the pearl surface with 5% having slight concentrated imperfections. Pearl Luster: Pearls produce a deeply intense shine, known as luster, when light is reflected off the many layers of nacre. The amount of luster a pearl has is as visible as a pearl size. This is the most important in defining a pearls beauty. The luster of a pearl should be the main focus when judging the quality of a pearl. To identify the finer luster, look at the clarity of light that is reflected in the pearls surface. The closer of a mirroring affect from the surface, the better the luster. Saltwater pearls have a greater luster than freshwater pearls. A higher luster can also be renowned to have a warmer glow. Pearl Nacre: The larger the pearl, the more nacre it has therefore the greater the luster. Nacre is the natural substance from which the pearl is actually created. Nacre is the substance the mollusk produces to protect its sensitive flesh from irritants as sand, shell fragments or implanted beads. The thickness of Nacre is only applied to saltwater pearls. It is not applied to keshi pearls or freshwater pearls as both are composed of solid nacre. Pearl characteristics such as colour and luster are actually characteristics of the nacre itself. Pearl Color: A pearl's colour is called its body color. Essentially, the colour of the pearl you desire is a matter of personal taste. Since pearls are produced in living creatures, their colours typically vary among white, cream, yellow, silver, pink or black. Pearls can also have a glow of a secondary colour, which can be seen when light reflects off of the pearls. This hint of colour is known as its overtone. The rarest and most desired are the white “rose” coloured pearls. Pearl Shape: Pearls develop in all shapes, especially Freshwater and Tahitian pearls. They be round, semi-round, drop, oval, half-rounded, semi-baroque and baroque shapes. A completely round pearl is very difficult to find and the rounder a pearl is, the better the quality, the rarer and more valuable it becomes. Ideally is for a perfectly round pearl, though there is much more to pearls than an ideal round. The real value of a pearl should be based on your own personal preference. Other shapes such as the near round or baroque are not symmetrical in shape, but can be lustrous and appealing and cost less than round pearls. To be considered round a pearl must have an almost perfect sphere whose diameter variation rate is less than 2%. A semi-round pearl has slightly imperfect spheres whose diameter variation rate is greater than a round's 2%, but less than 5%. A semi-baroque pearl exhibits at least one axis of rotation and is subdivided into four shapes: drop, button, pear and oval. 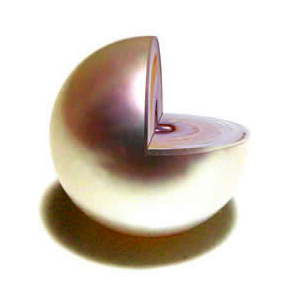 A baroque pearl does not have any axis of rotation at all. Pearl Size: The larger the pearl, the rarer it is. The size of a pearl is measured across its diameter, and ranges from 1mm to the scarce 20mm. Traditionally, Akoya (2.0mm - 11.0mm) and Freshwater pearls (2.0mm - 15.0mm) are smaller pearls and Tahitian or South Sea pearls are much larger(9.0mm - 20.0mm). The value of the size really depends on how unusual it is. Large Akoya cultured pearls are not large by Tahitian standards but a large one would be of higher value that a Tahitian pearl of the same size. Pearl Surface: With pearls the cleaner the surface and less flaws the more valuable it will be. However, a flawless pearl only comes about once in about every million. A good quality pearl will have a few blemishes or marks of course a pearl are from mother nature and few minor blemishes should be expected on all but the finest strands. A pearl's surface is probably the most obvious and easiest to examine. Look for the lack of disfiguring spots, bumps, cracks, discoloured portions, areas of low or uneven nacre appearance or any other flaw on the surface of a pearl, which is also known as "cleanliness." Notice that the highest quality pearls have a sharp, mirrored like reflection. The ideal good quality pearl is one that is free of imperfections (AAA).